Uh oh what's up with Bumble bee. 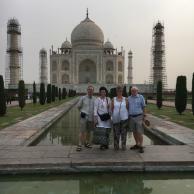 We got up at 4:30am to leave for the Taj Mahal an hour later, after a couple of Imodium tablets. All the guide books advise to visit in the early morning, before the heat and crowds. The site is open from dawn to dusk, and was just a 10 min ride from the hotel. 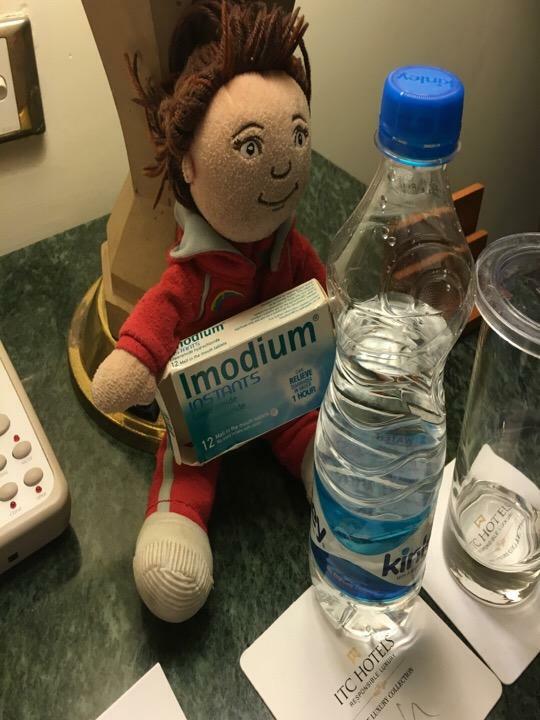 Had a bit of a disaster on the way in with the guards informing us that toys where not allowed in the Taj Mahal, tried explaining Olivia was not a toy but an important mascot for the guiding movement, but to no avail and she was placed under arrest and detained. Fortunately on payment of a 20R fine she was released into our custody when we left. Back to the hotel for a much needed breakfast. Rob as normal had two fried eggs on toast and o had my normal cheese and onion omelette. With our consumption of eggs on this trip along with the level of sweat, its surprising we ever would need a bathroom break. 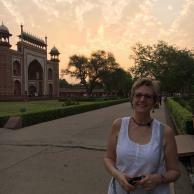 After a short rest back on the bus and off to the Agra Red Fort. This is spectacular fort with many white marble palaces inside. There is one palace inside that is beutiful white marble with inlaid semi precious stones, this was for his favourite daughter. Next door is a red stone painted white palace which for his not so favourite daughter. Good parenting. Back to hotel again for a rest. After a swim and a wonder around we where due to go off to the local bazar via a local stone mason. However we wound up spending 1 & 1/2 hours there seeing how they made the intricate inlays in the marble, making exquisite work in the translucent local marble. Wound up spending a bundle of money in the cooperative buying a marble table and some coasters ( however did get free beer ). Even Mr B couldn't be held back and bought some stoneware. Skipped the bazar and just back to hotel for an absolutely cracking Afghan meal all using hands only. Another top day in India.